Click HERE for News & Dates for your diary! Little Bedwyn is a small picturesque village on the North East boundary of Wiltshire. It sits in a gentle valley drained by the River Dun, alongside which travels the Kennet and Avon Canal as well as the Reading to Taunton branch of the Great Western Railway. In the heart of some stunning countryside we are close to Marlborough, Savernake Forest, Hungerford and Salisbury Plain. The village is well served by trains from Great Bedwyn, for London and the West. Although we are only 60 minutes by car from West London the village feels much more remote than that. There are some excellent schools nearby and the village is very family friendly. The wider Civil Parish of Little Bedwyn includes the hamlet of Chisbury and together with Chisbury the Parish has approximately 283 residents. Through its role as part of the Pewsey Community Area Little Bedwyn has received Pewsey Community Area match funded grants in the last year for repairs to a significant but unlisted boundary wall of the village green known as Church Meadow, a contribution towards the restoration of the church bells and a small Jubilee grant for access improvements to the villages’ community woodland known as Sandy’s Wood. 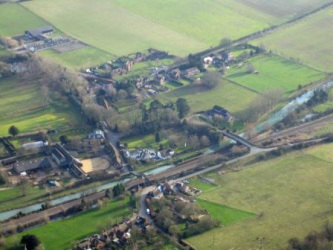 The existence of Little Bedwyn has been recorded since the early Middle Ages although in 778 it is thought to have been part of a larger estate held by the Kings of Wessex. Architecturally interesting buildings in the village area include the Grade 1 listed St. Michael’s church, the arcade nave of which originates from 1158 although the church was largely rebuilt between 1400 and 1500 and there are 19th Century alterations. St Martin's chapel, above and to the west of Little Bedwyn, is a thatched, flint structure originating from the early 13th century. It is now maintained by English Heritage and is accessible on foot from Little Bedwyn. The chapel sits on the edge of Chisbury Camp, an Iron Age hill fort consisting of earthworks encircling about 14 acres. Many of the redbrick houses and redbrick houses with blue brick diamond patterning in the village are historically associated with Manor Farm and were built from 1858. There is a smattering of thatched houses around the village and since 1985 the village has been designated as a conservation area.